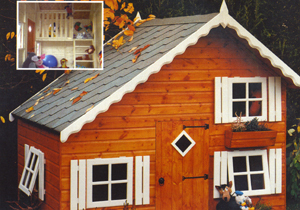 Children's playhouse for those little people who dream of their own little palace or den. Years of pleasure will result from owning one of these little houses for both user and spectator. Walls are constructed using 35 x 35mm (1¼ x 1¼") timber spaced at no more than 800mm (2@8") intervals. Felt tiles are available as an option in red or green. 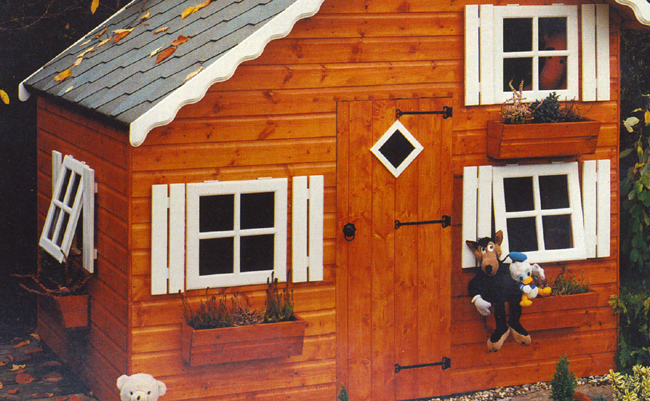 IMPORTANT: all playhouses comply with BS5665 EN71. Step onto a world of make-belief. A beautiful building that because of it's stunning appearance will give pleasure to all who see it. The side windows open, all other lower windows may open as an option. Artificial shutters and profiled facia complete the picture. Two shaped window boxes are supplied as standard and others may be purchased as required. The 'upstairs' is 830 x 1720mm (2'9" x 6') and comes complete with balustrade, ladder and banister rail. The photograph shows optional felt tiles and window boxes.